Live a special weekend on the occasion of the Pavarotti 10th Anniversary in the beautiful Verona with best seat tickets. Private transfer from the airport to the 5* boutique Villa del Quar (Venetian Villa – National Monument), 10 minutes from Verona and check-in. In the evening, enjoy a 4-course dinner with water, wine (1 bottle) and coffee included at the gourmand Arquade restaurant (of the hotel), one of the most famous of the region. After breakfast, private transfer for half day through local food&wine excellence. This is a tour with taste of food and wine, and especially, with the sense of the smell in the Valpolicella wine region. A professional guide will help you to discover this territory, the vineyards, and the secrets of the production and the wine cellar; than sit down for two wine-tasting session, including the great Amarone and Valpolicella! You will visit two of the most beautiful Valpolicella’s wineries and one “Bottega” of typical and local cheese as “Pecorino di Fossa” and cured meats as “Soppressa and Pancetta”. 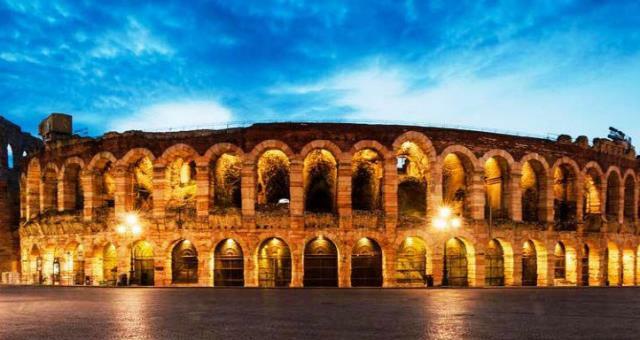 At the end of the experience, transfer to Verona and lunch at leisure (in a suggested restaurant – lunch not included) in a local restaurant in the city center. After lunch, private transfer to the hotel to relax. In the evening, private transfer to the Arena di Verona for the 10th Anniversary of Pavarotti (best seat). After the show, private transfer to the hotel. Private transfer from the hotel to Verona airport. – 1 half day private gourmet tour in Valpolicella with private guide and transfer at disposal also for lunch in Verona. – Everything not included in “The rate includes”.